Our Direct Digital 2 garment print system is Live. Our new State of the art Digital direct to garment printer with it's White ink printing system is up and running. Now it is easy and more cost effective then ever to get just one or just a few Custom printed t-shirts, Hooded sweat shirts or any garment printed. This system uses white ink printing that will image any color garment dark or light. It's amazingly large print area at 16" x 45". will let you image the entire front and back of a hoodie. It's push button digital t-shirt imaging at it's best. Additionally this system is using Water based inks. this means a softer less patchy, plastic feel to the final product. Art needs to be high resolution. 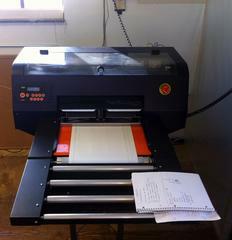 and you may not want to print something that is not thousands of colors.... this prints full color photographic images. It would be a waist to do just one one color shirt. But we'll do it too. Give us a call to see how we can assist you with any apparel decoration needs. 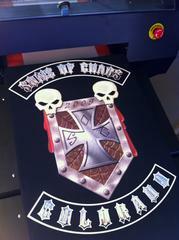 We do In-House full color screen printing, Embroidery, digitizing and graphic design. Visit us at t-shirtprintingdenver.com get a quick free estimate.